Ted says that the engine was built by NBL in 1925, so it is probably not surprising to see carriages still in WCJS livery. Ted cannot read the whole WCJS number on the vehicle on the right. It is WCJS � 33?. The ? could be an '8' or a '9' or something else. Ted asks however what is the peculiar shape in the panel above the number? The carriage on the right is former WCJS no. 333, a 42ft 0in x 8ft 0in flat-sided Letter and Parcel Post Van to D.94, built in 1885. It was the only one built to this Diagram, but a number of generally similar vehicles were built at the same time for use on the newly-introduced Special Mail service. Nos. 333 (D.94), 339 and 340 (D.95) were assigned to the Edinburgh carriage of the Down Special Mail. More information may be found in my book A Register of West Coast Joint Stock (co-author R.M. Casserley, HMRS 1980), including a photograph showing it involved in the Penrith accident of December 5th 1903. This photo reveals that the layout of the windows as shown in the Diagram Book is incorrect. That is a pity as I made a model of it before that information became available. The shape in the panel is a mystery to me, but it may possibly be some sort of paper sticker. The insignia are displayed in the waist panel but at an earlier date were positioned in one of the vertical panels towards the middle of the carriage. WCJS no. 333 was assigned LMS no. 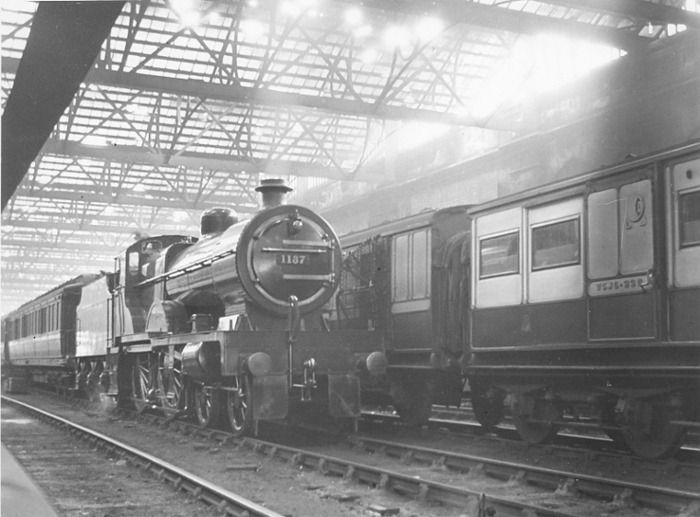 3272 (but never received it, nor LMS livery) and was withdrawn in 4/29 upon replacement by LMS-designed Post Offices. In its life it must have covered a huge mileage. It was originally radial, but was converted to bogies around 1896; the bogies shown here are of the 1901 pattern, so a further upgrade has taken place, probably around 1920. On the left is a 42ft 0in x 8ft 6in Post Office to D.87. These were displaced from the Special Mails when new 50ft 0in Post Offices were built in 1900. The location is clearly Carlisle Citadel station. LMS 4-4-0 Compound no. 1137 was built in 1925 by NBL and looks pretty new, suggesting a date in that year. The single lamp below the chimney is, I think, a tail lamp while shunting takes place. Behind it stands a 65ft 6in Dining Saloon, apparently still in pre-grouping livery. I cannot identify the service on which the WCJS carriages would have worked, but surviving information (especially for the 1920s) is only fragmentary. A shot in the dark here: the “...peculiar shape....” has what appears to be a letter ‘D’ in the opening; if the disk could be rotated might there be a ‘U’ at the other side. Down and Up?